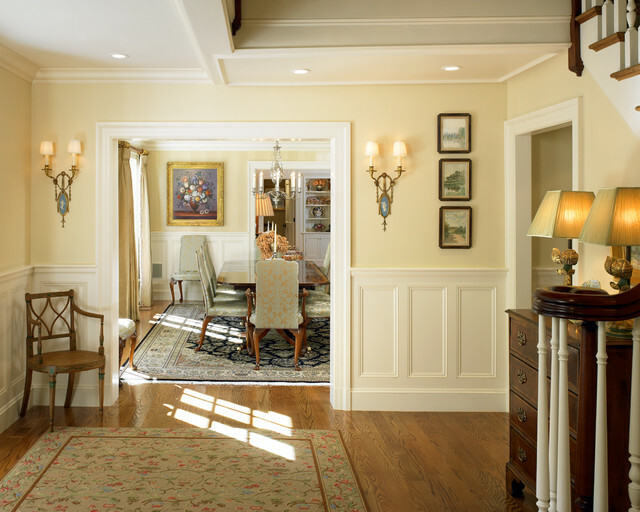 Wainscoting - The wainscoting has a very clean and uniform finish to it, the same way that kitchen cabinets do where they come pre finished ready for install with no need to paint on site. I am planning a wainscoting project and would be grateful for advise on how to achieve this finish. Thanks Patrick. Will certainly let you know. It may take a while as i know the site owner is having a few difficulties but will let you know. My wife and i have saved a lot of ideas on Houzz and would be nice to actually be more than an online scrap book. Hello Patrick, I love the look as well. Can you tell me what the wall color is? I love the combination. Could you tell me about the floor? What is the height of this wainscoating? I believe it is +/- 42" high. This home is exquisite! Who was the interior designer, please? We are not sure who the interior designer was for this project. If we find out we will let you know. What are the dimensions of the wall frames?? PENTHOUSE SUITE - DOWNTOWN MINNEAPOLIS.